I've been cooking the better part of the day. Sandy's on her way. Hurricane-force wind warnings have been issued for the coastal waters of seven states as Hurricane Sandy appears destined to enter the history books as one of the most exceptional -- and potentially destructive -- storms to strike the Northeast in modern history. Yesterday, a little unexpectedly, I learned to live with my fears, knowing they are born of my humanity, knowing that He will deliver me from them, and I found my peace. Now I'm seeking shelter. Not shelter from the storm, that we have. The storm is on its way, that is God's Will. We prepared as best we could, all we need do now is hide ourselves in Him. He is our shelter. We put things away; put things in order, it is now time to be still. 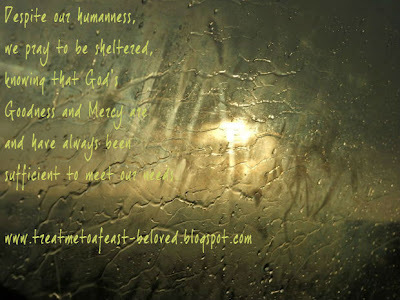 Despite our humanness, we pray to now for Shelter, Lord, knowing that Your Goodness and Mercy are and have always been sufficient to meet our needs. Faith reminds us that fear is unnecessary; out of step with faith. So Sandy, come and do what you must. Whatever happens is God's Will. And by the way, uninvited guest or not, I shall not be moved. I have Shelter in the time of Storms. When storms come, I have the blessed assurance that good comes soon after. And that assurance reminds me that my cup is never empty. I am reminded that God is good.